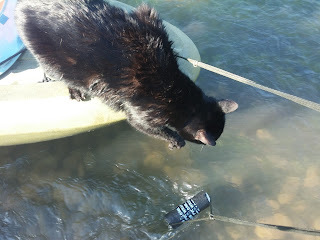 Many people are surprised at the thought of me, a cat, liking water. The truth is that I do not like water I simply tolerate it because I like being with my humans. The first time My humans took me in the water I clung to them with all my might. It was a scary time, but I knew I was safe with my humans holding me and then all by myself I started swimming. As long as I could swim or cling to one of my humans it was ok.
As the weeks passed my humans kept taking me on the kayak toy and in the water and slowly water became less scary. Once I even jumped in the water after a toy I was interested in. My human pulled me out of the water and I was confused why I did not get my toy? This last week I felt safe enough to walk around in the water all by myself to my humans before I went back to land. Comfortably I sit in the kayak toy and watch all that is happening around me without looking for land and without trying to get on land every chance I have. 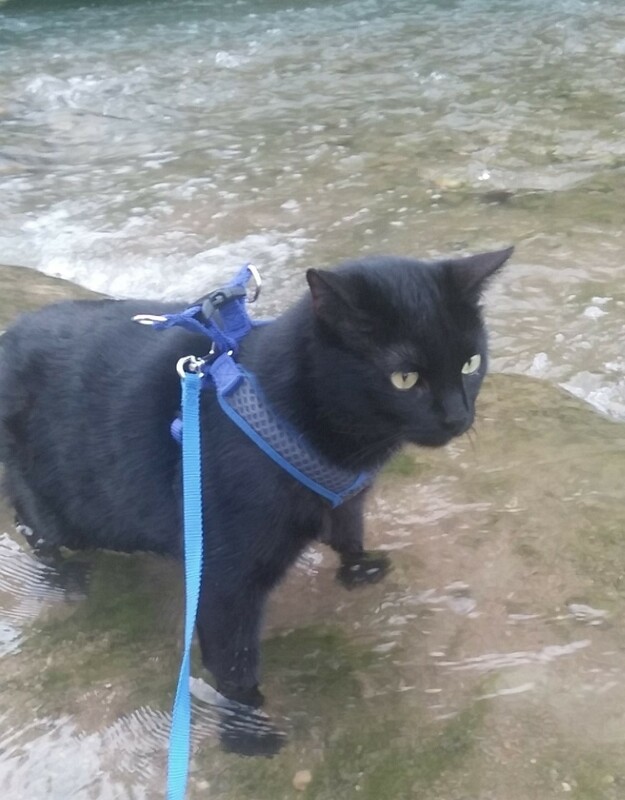 My humans are recording my progress so everyone can see how I am learning to like water. That's amazing!!! I look forward to following your progress. be careful in the water. Very interesting, nice to meet you. Have you checked out the other water kitties- Bailey the Boat Cat and Pawcific Purrsea? I have met Pawcific Purrsea, but not Bailey. Thankyou. I like water to drink but that's about it! YOU are doing GREAT!!! It will be so good for your pawrents if you can swim when you are on the Kayak. keep us all up to date you are so cool! One paw step at a time.